DROMORE High School principal John Wilkinson has called for a judicial review of admissions criteria into other schools for post-16 education. Mr Wilkinson was speaking at the school's prize night last week where pupils were being honoured for their endeavours over the last year. 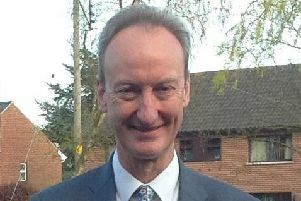 "It continues to grieve me that many of our top and middle band students still have to go cap in hand to other schools seeking admission to complete A Levels," he said. "Once again I make the point that if Dromore High School is not permitted by the Department of Education to deliver A Level type courses, then schools running them should apply consistent admissions criteria to their own and our students, giving all an equal playing field for entry. "Perhaps it is time a judicial review was taken asking questions of the admission criteria of these schools, and the way in which the admissions criteria are applied to the total post 16 candidature. "I urge the Department of Education to review their policy in this area and give direction to schools. "This year four of our students are travelling to RBAI (Inst) from our community to continue A Level education. Not by choice, they get up at 6 o'clock in the morning to make their way down to Belfast. "I have to say that the principal of Inst was delighted to receive our young men; and they are being treated admirably. Furthermore, she told me during my pastoral visit in September that Inst would be delighted to continue the relationship next year. "Whilst I appreciated the sentiments she was expressing and the trouble the school was going to in order to make our pupils valued and welcomed, I feel that we have to press on with our own plans to develop our own post 16 courses in Dromore High School. "As you know the original development proposal sent by the Governors and SELB to DENI seeking sixth form provision was turned down. I thank all parents and community representatives for their letters of support to the Department of Education. "They have refused our proposal – but I have already started negotiations with SELB and I hope to have another proposal with DENI before Easter." Mr Wilkinson started off the evening by praising the class of 2008. "Overall our results again were very good – approximately 20% above the regional average for non-selective schools," he said. Mr Wilkinson also congratulated pupils who had not missed a day of school, including Andrew La Marche who had not missed a day of school in 12 years. Last year the school celebrated their 50th anniversary with events including a biodegradable balloon race, a church service, Grease – the musical, a grand Gala Dinner, a school reunion and a grand fete and car boot sale. Mr Wilkinson added, "As part of our celebrations a group of students and Mrs Neil worked with Paul Wilkinson from the Dromore Leader to produce a newspaper supplement. "Paul commented, 'The amount and variety of copy they produced was first class. I am told the Morton Newspapers Group Editor and the NI Divisional Managing Director both commented favourably about the content and our own editor regards it as among the very best supplements we have produced. It was the students who came up with an outstanding and wide ranging list of potential articles, the students who researched and substantively wrote the articles, the students who conducted interviews and crucially met the deadlines. A sincere and wholly justified well done!'" Mr Wilkinson said the school has completed its first year within the Specialist School Programme, meeting their targets and being well on their way to their four year benchmark. Mr Wilkinson closed by saying the school had nothing to fear from the future. "A school like ours has always catered for a wide range of ability – and will continue to do so with success. "Secondly, change is needed. The selection procedure as it stands is a very rough instrument separating kids at a vulnerable age and distorting the curriculum in some cases as far back as P5. "Thirdly the procedure does favour a middle class elite and does give rise to a meritocracy. An alternative needs to be sought to give freedom of opportunity to everyone. "Fourthly an unregulated system at 11+ where the grammars do their own thing betrays an ideology which is protectionist. "However whilst our political overlords use education as a political football our students continue to achieve great results; individually and collectively; but all of these have been due, in the main, to well developed and caring relationships. This is what makes this school a great school." Bowman Shield for Music - David Currie; Business Studies Cup - Richard Thompson; Bombardier Centenary Shield - Andrew La Marche; Cantley Cup Senior Rugby - Jamie Kirk; Clayton Cup for Expressive Studies - Lauren Bernard; Drama Cup - Tamah McMillan; Equestrian Spirit Award - Jonathon Mulligan; Exemplary Conduct Cup (Junior) - Matthew Duddy; Exemplary Conduct Cup (Senior) - Leah Redmond; Girls' Contribution to Team Games - Shannon Brush; Graham Cup for Special Achievement - Timothy Cooke; Gribbon Shield for GCSE PE - Julie Morton; Harrison Cup for RE - Pamela Gibson; History Cup - Colin Munn; Hockey Cup - Julie Morton; Home Economics Cup - Lauren Bernard; Jubilee Cup for Outstanding Effort - Lauren Bernard; Laffins Cup for German - Gemma Gibson; Mackey Cup U16 Rugby - Christopher Leathem; Malcolm Odger's Cup for Art - Hollie McDonald; Master's Cup Junior Rugby - Thomas Jess; McBride Cup for Endeavour - Roger Lemon; McCabe Shield for Business Studies - Jill Poots; Moore Cup for English Language - Julie Morton; Northern Bank Cup for Community Awareness - Debbie Johnston; Odger's Bursary - Timothy Cooke; Office Applications Cup - Leah Redmond; Office Applications Cup Foundation Level - Ethan Sudlow; P.E. Department Shield Boys	Jonathan Rowland; P.E. Department Shield Girls - Elaine Fitzpatrick; Patterson Cup for Mathematics - Pamela Gibson; Project Business Shield - Gareth Rowan; Rea Cup for English Literature - Tamah McMillan; Robbie Moore Cup for Double Award Science - Pamela Gibson; Robin Moore Cup for best contribution to school - Julie Morton; Savage Cup for Road Traffic Studies - Mark Camblin; Semple Cup for Languages - Pamela Gibson; Sloan Cup for Single Award Science - Lawrence Boyd; Sportsmanship Cup Boys - Jonathan Clements; Sportsmanship Cup Girls - Lisa Stewart; Tayto Business Studies Cup - Jonathon Mulligan; Ulster Bank Cup for Academic Achievement - Pamela Gibson; Ward Shield for Computing - Leah Redmond; Wilkinson Cup for Geography - Pamela Gibson; Wilkinson Cup for Technology - Andrew La Marche; Year 8 Scholastic Performance Cup - Shannon McGurnaghan. Ryan Adair; Nicole Afonso; Robin Barr; Michael Beatty; Thomas Beck; Jerald Belmonte; Lauren Bernard; Christopher Boal; Jordanne Boal; Lyndsey Bower; Lawrence Boyd; Samantha Boyd; Tyla Briggs; Lydia Brown; Zara Brown; Shannon Brush; Sarah Cain; Mark Camblin; Amelia Campbell; Helen Cantley; Nicola Carlisle; Kathryn Chambers; Daniel Chapman; Lana Cheaito-Hood; Gareth Childs; Gemma Clark; Jonathan Clements; Timothy Cooke; Gemma Crawford; Jamie Crooks; Robert Crossland; Rachel Crozier; Shelley Cully; Lee Cunningham; David Currie; James Currie; Bryan Davidson; Colm Donaghy; Zara Dyer; Stefanie Elder; Jenna Fisher; Matthew Flanagan; Chloe Fleming; Holly Forsythe; Melissa Gamble; Claire Gardner; Gemma Gibson; Pamela Gibson; William Gibson; Matthew Gowdy; Kirsty Graham; Lance Graham; Benjamin Greenslade; Lewis Gregg; Jack Grehan; Nathan Haire; Joshua Hammond; Christine Hanna; Andrew Hardman; Graham Harrison; Kyla Herron; William Herron; Rachel Hewitt; Nicole Hodgen; Jamie Huddleson; Emma Hudson; Lauren Hughes; Stefan Hull; Nicola Hunt; Katie Hunter; Matthew Hynds; Stephanie Ireland; Milna Jaison; Kayleigh Jess; Stuart Jess; Debbie Johnston; Louise Keery; William Kelly; Christopher Kernaghan; Charmaine Kinkaid; Jamie Kirk; Jasmine Kirk; Andrew La Marche; Christopher Leathem; Roger Lemon; Corey Linton; Christopher Magill; Justin Malcomson; Daryl Marks; Danielle Marmion; Gary Martin; Joanne Martin; Christopher McCandless; Hannah McCarthy; Leanne McCaughtry; Rachel McComb; William McCracken; Nathan McCrory; Hollie McDonald; Aaron McDowell; Adam McDowell; Joshua McDowell; Matthew McDowell; Lisa McEvoy; Sophie McKenzie; Benjamin McKinstry; Alannah McManus; Tamah McMillan; Andrew McNeill; Andrew Morrison; Michael Morrison; Heather Morton; Julie Morton; Harry Moulds; Conor Mulholland; Fraser Mulholland; Jonathon Mulligan; Colin Munn; Kim Murphy; Nikita Murphy; Scott Ogle; Jenny Orr; Shanice Patel; Jonathan Redmond; Leah Redmond; Rachel Redmond; Gareth Rowan; Aimee Russell; Noel Savage; David Skelton; Kathleen Skelton; Adam Smart; Melissa Smith; Susannah Smith; Elaine Sneddon; John St Clair; Lisa Stewart; Timothy Stewart; Ethan Sudlow; Jamie Taggart; Alexandra Thompson; Gemma Thompson; Richard Thompson; Chelsea Walker; Conor Walker; Graham Walker; Tony Walker; Melissa Warke-McCormack; Oliver Warren; Suzanne Warwick; Rebecca Watson; Laura Wilkinson; Amy Wilson; Victoria Wray. Year 8 Class Prize (8A) - Shannon McGurnaghan; Year 8 Class Prize (8H) - James Tinsley; Year 8 Class Prize (8L) - Lucy Smith; Year 8 Class Prize (8R) - Honor Travers; Year 8 Class Prize (8S) - John Ashfield; Year 8 Class Prize (8T) - Stephen McVicker. Year 9 Class Prize (9A) - Orin Sudlow; Year 9 Class Prize (9H) - Grant Dillon; Year 9 Class Prize (9L) - Matthew Redmond; Year 9 Class Prize (9R) - Conor Browne; Year 9 Class Prize (9S) - Isaac Barr; Year 9 Class Prize (9T) - Richard Pickering. Year 10 Class Prize (10A) - Simon McCracken; Year 10 Class Prize (10H) - Fiona Cunningham; Year 10 Class Prize (10L) - Matthew Dorman; Year 10 Class Prize (10R) - Andrew McKee; Year 10 Class Prize (10S) - Stuart Ferris; Year 10 Class Prize (10T) - Kathryn Hutchinson and Matthew Corbett. Robin Barr, Jamie Crooks, Lawrence Boyd, William Gibson, Timothy Cooke, Lance Graham..
English - Christopher Boal, Emma Hudson, Justin Malcolmson. Maths - Robin Barr, William Gibson, Melissa Gamble, Lewis Gregg, Daniel Chapman, William Herron, Timothy Cooke, Stephanie Ireland, Bryan Davidson, Laura Wilkinson. Year 8 - Laura Atkinson, Samantha Kidd, Rachel Smith, Amy Compton, Gareth McClune, Matthew Steele, Andrew Cooper, Jonathan McCormick, Matthew Surgenor, Aaron Croskery, Lynn McCutcheon, Matthew Walker, Katie Finlay, Jonathan Patterson, Catherine Wallace, Victoria Gault, Philip Sands, Tyler Waring, Jason Gribbon, Hanna Scott, Sarah Wright, Jordan Hayter, Patrick Scott, Alexander Young. Year 9 - Jack Bell, Lee Geddis, Andrew Sleator, Conor Browne, Simon Henderson, James Sloan, David Cantley, David Henshaw, Suzanne Ward, Alan Childs, Erin Leeper, Emma Wright, Ryan Clinghan, Amy Robinson. Year 10 - Rebecca Burrows, Stevi Pelan, Bobby Surgenor, Nikita Harron, Rachel Robinson, Chelsey Whan, Simon McCracken, Jessica Sloan, Jordan McKibben, Peter Smith. Year 11 - Stuart Beggs, Danielle Logan, Sancha Talbot, Jessica Davison, Bradley Martin, Felicity Towell, Serena Dillon, Johnson Orr, Glenda Ward, Rebecca Galbraith, Matthew Scott, Monique Harron, David Sleator. Year 12 - Ryan Adair, Andrew Hardman, Gareth Rowan, Nicole Afonso, Graham Harrison, Melissa Smith, Thomas Beck, Christine Hanna, Lisa Stewart, Gemma Crawford, Charmaine Kinkaid, Ethan Sudlow, David Currie, Corey Linton, Richard Thompson, Jenna Fisher, Andrew Morrison, Graham Walker, Gemma Gibson, Colin Munn, Suzanne Warwick. TWELVE YEAR FULL ATTENDANCE - Andrew La Marche. FIVE YEAR FULL ATTENDANCE - Helen Cantley, Pamela Gibson, Matthew Hynds, Gareth Childs, Andrew La Marche. YEAR 8 - Philip Allen, Jordan Hayter, Jack Walker, Joshua Cargill, Adam Houston, Drew Watson, Rebecca Fletcher, Patrick Scott, Toraigh Fletcher, Owen Tay. YEAR 9 - Kirsty Adams, Lauren Hanna, Yasmin Morgan, Paula Adams, Serey Harte, Caroline Reddick, Hannah Blackwood, Simon Henderson, Robyn Fisher, Dale Johnston. YEAR 10 - Ashleigh Coyle, Matthew Duddy, Adam McBratney, Sarah Creighton, Nikita Harron, Charlotte Nelson. YEAR 11 - Judith Clarke, James Hooke, James McCabe, Serena Dillon, Ryan Kerr, Jill Poots, Wade Graham, Danielle Logan, Glenda Ward, Rachel Hoey, Bradley Martin. YEAR 12 - Jordanne Boal, Andrew la Marche, Gemma Thompson, Timothy Cooke, Roger Lemon, Connor Walker, Jamie Huddleson, Frazer Mulholland, Laura Wilkinson, Jasmine Kirk, Rachel Redmond. CERTIFICATES FOR OUSTANDING EFFORT AND PROGRESS - Nicole Afonso, Gemma Gibson, Robin Barr, Pamela Gibson, Lauren Bernard. CERTIFICATES FOR ENDEAVOUR - Lawrence Boyd, Nicole Hodgen, Colin Munn, Matthew Flanagan, Roger Lemon, Rebecca Watson, William Gibson, Hannah McCarthy, Laura Wilkinson, Christine Hanna, Andrew McNeill, Andrew Hardman, Frazer Mulholland. Head Boy Certificate - Bradley Martin, Head Girl Certificate - Danielle Logan, Deputy Head Boy Certificate - James McCabe, Deputy Head Girl certificate - Serena Dillon. Cowan Heron - Jenni Ewing, Tom Jess; Ferguson - Emma Wilson, Ethan Gibson; Percy - Glenda Ward, Matthew Morrison. Attendance Cup - Percy, received by Glenda Ward; Sports Championship Cup - Percy, received by Glenda Ward; Wilson Cup For Scholastic Performance - Cowan Heron, received by Jenni Ewing; Sand's House Championship Cup - Percy, received by Matthew Morrison.